International Mugham Center and the Institute of Folklore have launched a joint project. 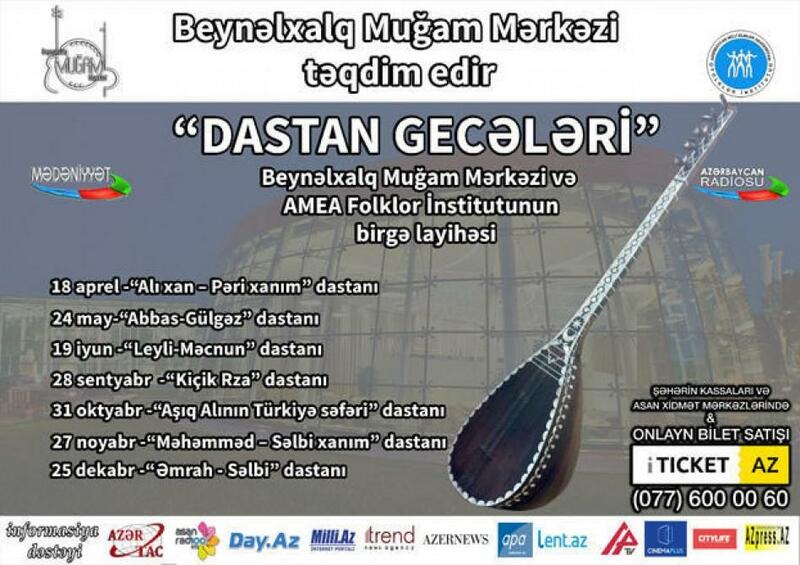 Spectacular evenings of dastan, an ornate form of oral history will be held at International Mugham Center. The concerts programme are following: Azerbaijani dastans, including "Kiçik Rza" (September 28), "Aşıq Alının Türkiyə səfəri" (October 31), "Məhəmməd – Səlbi xanım" (November 27), "Əmrah - Səlbi" (December 25) . Tickets can be purchased at all ticket offices of the city, ASAN Service Centers, website www.iticket.az. International Mugham Center has already implemented a number of projects including "Evenings of ashug music", "Treasury of Secrets", "Unforgettable", "Pearls of ethnic music", "Evenings of mugham", etc. Dastan is one of the oldest and largest examples of the artistic thinking of the Azerbaijani people. Dastan, being mainly a product of ashug-ozan creativity, is a manifestation of epic thinking, as well as the main factor connecting ashug creative work and oral folk literature. In 2009, the art of Azerbaijani ashugs was included in the UNESCO List of Intangible Cultural Heritage. Dastan unites poetry and prose. For this reason, dastan is considered not only an epic, but also a lyric-epic work. Dastan is divided into heroic and love. The heroic dastan tells about the heroes fighting for the freedom of the native land and the independence of the people. "Kitabi-Dede Gorgud", "Koroglu", "Kachag Nabi", "Kachag Kerem", "Sattarkhan" and other works are examples of the heroic epic. Love dastans include "Asli and Kerem", "Tahir and Zohra", "Abbas and Gulgez", "Shah Ismail", etc. Sometimes dastan may feature motifs from another dastan. Although "Shah Ismail", is a love dastan, heroic theme can be also found in the dastan. Azerbaijani dastans are created on the basis of a unique composition. So, unlike heroic dastans, love usually begins with three introductions, a chanting character, and end with a traditional text called "duvaggapma." The final text of the tragic love dastans is called "Jahannam". As in fairy tales, dastans begin with garavelli, .e. small introductions in verse form.